So 2NE1's new song came out last week and I've been addicted to the song. It's currently playing on my music player for this blog (〃＾▽＾〃). I saw the music video and I really liked their eye makeup especially CL's and Minzy's. 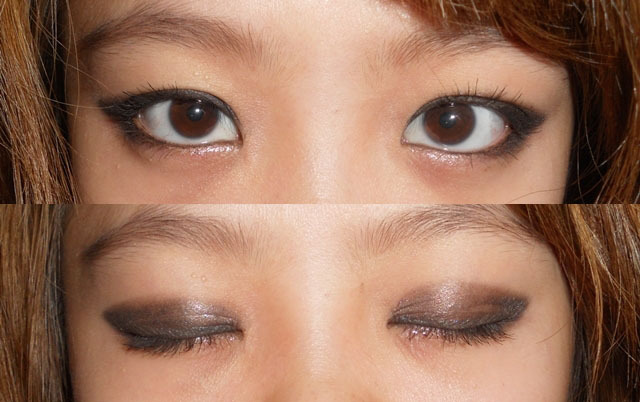 I decided to so a tutorial on Minzy's. Minzy looks so grown up now! I can't believe that she's younger than me LOL. First row: Prepping the eyes with Urban Decay Eye Primer potion and using NYX Jumbo Black Eyeshadow pencil as a base. Second Row: Using a brush, I winged out and got the general shape of the eyes. Next, I brought down the black to my lower lash line as well. I brought it in about 2/3 into the lash line. Third Row: Then, I tight-lined my upper lash line and bottom lash line to intensify the look. Then, I lined my eyelids with a gel liner with a wing as well. Fourth Row: I took a black eyeshadow (I used "Creep" from my NAKED palette) to darken the look. Plus layering helps the makeup last longer. Fifth Row: I did the same with the bottom lash line, and then I add some white shimmery liquid eyeliner to the inner corners of my eye. Sixth Row: I took "Hustle" from my NAKED palette and smooth out the edges. I noticed that Minzy had some purplish-brown color on her eyelids so I did the same haha. Seventh Row: Lastly, I curled my lashes and used mascara. You can use false lashes if you want, but I couldn't find my lash glue so this is all I can do LOL. And I used Revlon Lipbutters - Creme Brulee and Tutti Frutti on my lips. I just mixed the colors and then added Artistry - Confetti lip gloss on top. 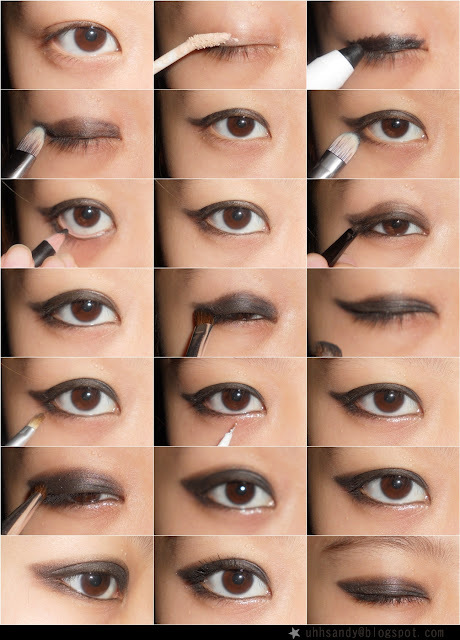 Hope this tutorial was helpful (^～^) . Btw. This is very similar to how I did my "edgy" look from before, but this look is more "pointy". oh wow edgy and smoky makeup look really good on you!